Celebration is in order! Someone just graduated and they need the perfect gift. 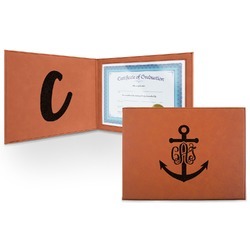 What better gift than a gorgeous leatherette diploma holder? You could even use this holder for other big certificates or achievments! This cognac leatherette diploma holder is the perfect way to display or store your diploma or certificate. The smooth leather gives the perfect refined and professional look. When closed, the diploma measures at approximately 12" x 9". On the inside of the diploma holder is a clear vinyl window that measures at 10.5" x 7.5", but the pocket itself is large enough to hold an 8.5" x 11" certificate or diploma. Go into our design center to start the personalization process. The diploma cover is personalized on the front cover as well as the inside cover! It will be laser engraved with your choice of text, graphic, or monogram. Put your school logo on the front and a dedication on the inside. Or maybe you have the perfect inside joke! Whatever you do make it yours. And if you need any help just ask. We are here for you. Complete this gift with a leatherette portfolio with a notepad or a journal! These leatherette products are the perfect gift for any girl or guy!